This is the other best book I have ever read. This story was so smooth and different and just charming. I can't explain the best parts of the story except to say the characters, storyline the whole package . The worst part of the book was it ended. 4.0 out of 5 starsBetter than I thought it would be! It took place mostly on a ship. I thought "we'll there's only so many things that can happen on a ship", but I was wrong. It was inviting, entertaining and had a great plot. I was a bit disappointed in the ending as it was rushed through and I think it could have been given a couple more, if not more, pages to expand on it. Maybe it will pick it up on book 3. Happy Reading!! Not Tessa Dare’s best, but not bad either. The hero and heroine are okay, but not especially endearing. This is the second book of the Wanton Dairymaid Trilogy. The first was the best; the third was the worst. This ranks right in the middle. 5.0 out of 5 starsA sweet novel! I absolutely devoured the first novel in this series (Goddess of the Hunt), and because I DID enjoy it so much, I was worried that the other novels in the series wouldn't meet my expectations. I am happy to say that this was NOT the case!! 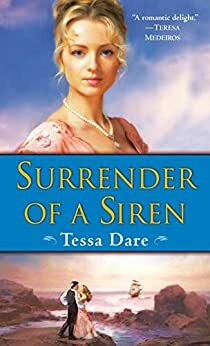 I adored Surrender of a Siren; Sophia was a favorite character of mine in Goddess and was hopeful that she would find happiness with someone other than Toby (who fell a little short in the first book). The sparks between Gray and Sophia are amaaazing. Highly recommend this book (and most of Dare's other novels too!). I love when a new author bursts on the scene, puts out a great first book, and then exceeds my expectations on her follow-up. With "Surrender of a Siren," Tessa Dare reaches the potential she showed in "Goddess of the Hunt," but with even sharper writing, humor, and dialogue. Plus, she has clearly done her research about 19th c. life on the high seas, and the insertion of sensory and historical details here and there add depth and interest to the plot. Sophia was first introduced in "Goddess of the Hunt," but here she becomes a much more likeable and complex character. Determined to seek true passion and cease pretending to be a demure Miss, Sophia leaves her fiance, Toby, at the altar and races off to board a ship to Tortola. She immediately both frustrates and intrigues Captain Grayson, the owner of the ship, and he, in turn, frustrates and intrigues Sophia. From there, the two embark on a flirtation complicated by two things. First, that Sophia is pretending to be Jane Turner, a governess traveling to her next post, and secondly, that Gray is doing his best to stop his raucous, womanizing ways and be more respectable for his sister's sake. The result is a nicely paced push and pull with sexual tension that slowly builds. In fact, whereas "Goddess" opens with a kiss between the hero and heroine, this novel gives us more time to get to know the characters before they actually give in to their attraction. There's never a dull moment in this book, but it also never feels over-done. In fact, I think Tessa Dare did a great job of paring down the story while still developing her characters to a point where it's easy to find them charming and likeable. The conflict also builds to a fun, witty, and surprising conclusion in a courtroom (I won't say more). Finally, there are great supporting characters in this novel, namely Stubbs and Joss, which shows that Dare is able to add layers and build up to future books without sacrificing the momentum of the current novel. If you like Julia Quinn and Eloisa James, I think you'll enjoy Tessa Dare's books. I, personally, can't wait for the next one.